Notepad is one of the most used built-in programs in Windows operating system. It’s often used to jot down quick notes like writing down contact numbers, addresses, and other details. While Windows operating system has evolved over the past two decades, the Notepad program has not changed at all. The user interface has not seen any changes for the past two decades. The same is the case with functionality as well. This time around, Microsoft seems to want to make the Notepad a little more better by adding new features. Starting with Windows 10 Redstone 5, Notepad has new functionality. 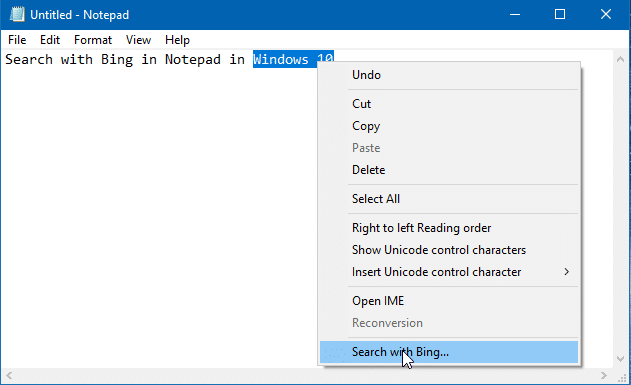 You can now search for a word using Bing search right from Notepad. That is, you can right-click on a word/sentence in Notepad, and then click Search with Bing option to search the world wide web for that word with Bing. Users who prefer using keyboard shortcuts can use Ctrl + B shortcut (after selecting a word or sentence) to search for the word with Bing web search. The feature is really helpful to quickly know the meaning of a word or spelling of a misspelled word as you don’ t need to manually open up a web browser and search for the word. Note that you need to select the entire word that you want to search with Bing before right-clicking on it (the Search with Bing appears even if you have not selected the word) and clicking Search with Bing option to search for the word with Bing search. If you simply right-click on the word without selecting it and then click Bing with Search option, only the Bing search homepage will be opened instead of searching for the word (you will need to type the word manually). The Bing search result for the word/sentence will be opened in your default web browser, even if you are using a browser other than Edge as the default browser. However, currently, there is no option to change this default search engine from Bing to Google or any other search engine. Between, did you know that you can configure Windows 10 to automatically correct mistyped words in Notepad and other programs? You might also like to add spelling checker to Notepad program.